Now, that is hard to believe. I remember walking into the gym on her first day at the college and watching her shoot. I knew that I had signed a good player, but she looked better than I thought. During her freshman season, though, she struggled down the stretch, and her three-point percentage dipped to 33% by year’s end. I had to look up her percentage, as I would have guessed that she shot 37-39% during her first year. She can shoot. I have not taught her anything. 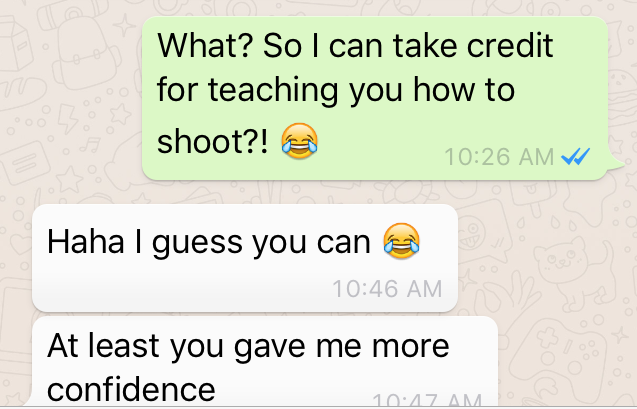 I refused to allow my assistants last season to say a word about her shooting. We have worked to improve her balance. We practice shooting when tired. We try to shoot good shots. As a coach or trainer, I have done nothing technical. I have never said a word to her about how she holds the ball, bends her knees, or follows through. I have not told her to turn or not to turn. I have not provided a single word of common shooting instruction. I have several shooters on my team; as I write this, one leads the nation in three-point shooting percentage. When I have talked to her, and we have spent a considerable amount of quality time together recently due to some trips to the emergency room and follow-up doctor visits, she has told me that she never considered herself to be a shooter previously. She recommended a friend to me as a potential recruit, and called her friend a much better shooter. I have taken her out of two games for passing up open shots. Another player arrived as a very good mid-range pull-up shooter, but was never much of a three-point shooter; she started her freshman season shooting 18% from the three-point line through the first 10 games. She’s closing in on 100 made three-point field goals in her two seasons and shooting over 36% on James Harden-like attempts. I have not said a word to her about her technique in two years, despite her constant questioning. I told her when she arrived that she had to be a three-point shooter. Despite working out with her more than anyone over the last two years, I have said almost nothing related to her shooting technique. Everything is focused on balance, footwork, and confidence. As the player said in the text, my effect on their shooting is primarily confidence (wrote about this previously). I encourage three-point shots. We run plays to get three-point shots. I do not take out players for missing three-point shots. When players arrive, I explain that if they are not a three-point shooter now, they better become one. We have a player who told me in the summer that she was a non-shooter; she was sub-40% from the free-throw line last season before transferring. In our last game, she was 2/2 from the three-point line and 8/11 from the free-throw line. Confidence. As I write this, we are 2nd nationally in 3-point field goals, 5th in 3-point field goal percentage, and 12th in free-throw percentage. Yes, I target players who I believe are shooters, but in several cases, it appears that I saw them as shooters before they did. I do not instruct a lot on shooting technique. We shoot a lot during practice (although we rarely shoot free throws), and we value shooting. We do not have a Dr. Dish in our gym. Players shoot together and rebound for each other. The biggest factor in their development, I believe, is comfort and confidence. They know they can shoot and will not be punished. I challenge them to shoot from further out. I yell at them to shoot as soon as they cross the volleyball line. I take out players for not shooting open shots rather than taking out players for missing shots. We have a culture of shooting, I suppose, and the culture — from the type of practice, to the extra shots, to the comfort and confidence — is how we develop 40% three-point shooters. I went from averaging 8 points per game as a senior in high school to averaging 22 points per game my sophomore year of college. Coach McCormick's workouts and drills played a key role in my vast improvement. Coach McCormick has put together the most complete book about shooting that I have ever seen. His breakdown of shooting methods and techniques are essential for athletes who want to improve their form and accuracy. Coach McCormick's attention to detail and specific teaching techniques provide a perfect framework for players at every level to build technically sound shooting form. There are pieces of his program that can be utilized by every player, at any level to bring rapid improvement to the bottom line: MAKING MORE SHOTS! I always look forward to reviewing new work done by Brian McCormick, because I know it will be well-researched, insightful, and cutting edge. His 180 Shooter did not disappoint. Brian has a critical eye and great ability to break down complex basketball movements into their most fundamental elements, and then incorporate an effective training protocol to progressively teach their mastery. 180 Shooter will be a valued addition to my training resource library. Brian McCormick is an outstanding coach, instructor and writer. His newest book, 180 Shooter, covers in great detail how to become a better shooter from the ground up. Brian worked for my program (Hoop Masters) as a coach and his attention to detail and ability to teach young eager players is a special gift. I would recommend the 180 Shooter to any player, coach, or parent that really wants to understand all aspects of improving your shooting percentages and overall shooting skills. In this day and age of quick fixes and short cuts it's refreshing to have someone take the time to really explain how to become a better shooter. If you follow the drills, practice the habits outlined in this book and really believe that you can become a better shooter. You will. There are no short cuts to improvement.